Lots open and CPU and RAM are happy. We have eight ways to access internet to performa variety of day to day functions in our home. Three of which can do it completely independent from our home’s ISP. This sounds like a lot because it is. It’s actually shocking to think about it. How dare we!! The only device in this mix that doesn’t really fit is the new MacBook Pro with Retina Display. Our 15″ MBP– 15inch 2008 model. This was way back when mac books still made them out of multiple pieces of aluminum and no one had heard of Michael Phelps. It’s been dropped and stepped on back packed and thrown around. OS 10.8 has finally been left behind but we don’t mind. Since the iPad came to our house it’s been the Hulu Plus to TV hookup for those few shows (ie The Middle) that don’t allow Hulu Plus from a dedicated device. (Someone please explain this business model to me) Before this laptop I was going through them about one a year. Submarine racks are not conducive to 5 lbs of poorly engineered hardware. Our 13″ MBP– 2010 no upgrades. It was bought to allow me to hold out for what I just bought. It did our house good for the last few years. It’s been set down on the couch nearing on 1,000 probably. It’s gone through airport security dozens of times and travels with me to classified depth in a submarine. iPad– 16GB 3G, bought the month they came out. It’s aided in the navigation of nuclear powered submarines as well as vans of crying kids. It’s taught my son to count and has made The Monster at the End of the Book come alive. It’s my main browsing, media consuming, and email device. iPhone– My wife and I each have one. I think they should be including in Grey’s next edition of The Anatomy of the Human Body based on our dependence of them. MacBook Pro with Retina Display– base CPU with Ram upgrade and Apple Care. So which one do I buy? I didn’t get to see any performance tests but just based on the GHz values the better CPU’s seemed above the break point of value. I got the RAM upgrade and Apple care for the same reason that San Francisco has banned these products for government purchase, everything that could be soldered is. There’s no hope of RAM upgrade down the road and no hope I’d be able to repair anything. Cracking the display is $1,000 easy. So upgrading the RAM and buying Apple Care seems a no brainer.So I unboxed it last week, it kind of felt like a child’s Christmas. It’s pretty but at a cost. Little things like the external battery display are gone. I’m not complaining mind you. Its sits on my lap for hours chugging away at heavy tasks and still has plenty of battery life left over. I think Apple has placed a small fusion reactor inside somehow. Once I do plug it in it requires babying, an engineering blunder has caused the magsafe cord to be VERY sensitive and falls out way too easy. Big but light. The screen size was a treat for my eyes that are used to my 13inch and iPad. Those 17inch buffs out there may be disappointed, but will still buy it. Display is amazing but under used. I love it I love it I love it. It’s truly amazing. My only issue is one Apple can’t do anything about. Lots of applications don’t support retina yet. Apple has done a wonderful job at integrating retina and non retina items at the same time. If you take a look at the image above you may notice the resolution is terrible. Thats because you are looking at it on your display. Try clicking on it. Using IE (as I’m forced to at work) hit the zoom in button. You’ll notice you have to scroll left and right to see it zoomed in. Its because its 2880 by 1800 pixels!!! 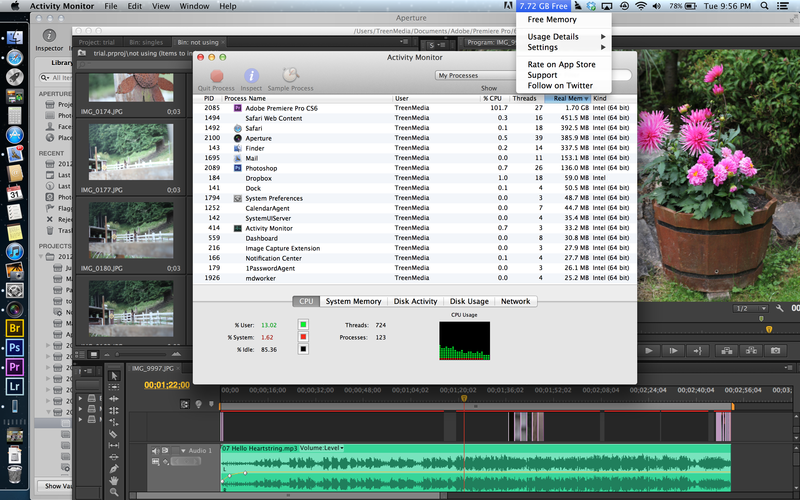 Take a look at what portions of Adobe Premier Pro CS6 support retina and what parts don’t. The static text all is supported. The moving text in the program pane (AKA timeline) lots terrible. It’s not terrible its just being showed next to pure eye candy. Worst thing is the flower picture. That picture and the thumbnails to the left look pixelated. They were all taking in focus so its a shame. I want to try out tethering but can’t put Canon EOS utlity on because its not supported by Mountain Lion. Supported apps shine. I do use Aperture and it is truly amazing and efficient. When I post process my portrait shots I am a pixel peeper. I love the eyes to be crisp and bright. To do this I’m in the habit of pointing the mouse on the eye and hitting “z”. This zooms in the all the way until there’s a one for one pixel use of the screen. I actually thought this function was broken the first time i did this one the new mac. I hit “z” over and over again and it was only zooming in a very small bit. Come to find out since I had been shooting at lower resolution (to achieve a stop motion effect in video) that the screens 2880×1800 pixels was almost already fully zoomed. Of course there’s Final Cut Pro. Since i decided to go Adobe I’m anxiously drooling over the Retina based benefits explained by Apple here under “video editing”. It’s our go to device. Here’s why… Although it didn’t have a place in our home when it arrived it’s here to stay. I don’t surf the web on my iPad anymore, I don’t consume media and I don’t read and write email on it. I don’t post process photos or video on my 13inch. I don’t miss the rainbow beach ball. I’m just gravitating to the best user experience. My iPad and 13″ have been my good old faithful, but they just don’t compete. Everything is better on the new MBP. 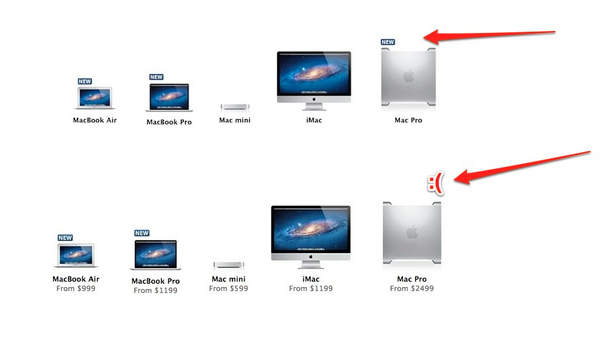 The entire Apple version of technology hasn’t changed, it’s just become more Apple. Everything that used to be smooth and fluid is now even more so. It does everything with no delay. I watch my CPU processor (Activity Monitor dock mod) and RAM (Free Memory) all day long. I developed this habit on my 13inch trying to process photo’s to hone done and try to minimize time spent watching the ball. Now I gloat over not seeing the Ram get below 11GB free and the CPU not even registering as 1/16th in use. More functional based. If I added 1500 stills to my Premiere Pro timeline as 3 frames but wish I could do 4 I can now select, hit delete, modify the timing, paste and go microwave my coffee for 30 sec. This action was not even in my vocabulary before. Sunday we were heading home and the NBC Olympics app texted my iPhone that Michael Phelps was swimming in the 400m at 2pm. We were 30min from home and it was 1:32pm. We cut the cable cords years ago. We consume lots of media, but its all internet based. Do the math and you’ll see why my wife was getting frantic. My mind quickly went through the scenarios of using the various capable devices displaying this momentous occasion. I didn’t have time for fiddling though. Even though I have 8 devices that connect to the internet when I got home I choose the MacBook Pro with Retina Display. By the time I had the cover open the computer was out of sleep and ready to go. Clicking on safari brought up a graphic display of previous website, all with current content. Even though about 9 webpages were showing on screen and all at a weird angle I could easily spot Michael Phelps on one because of the display quality and selected it 1 sec later. I walked over to the TV and turned it on. I walked back and play button was ready. I hit it and my new Airplay button. The TV was the long lead. As soon as it was on I switch inputs to the Apple TV and had audio and 1080p video all in the time it took my wife to get our sleeping son out of his seat and walk in. It’s not that this new MBP performs some new function, because it doesn’t, it’s just that it does previous tasks so much better The magnitude of that “so much” is enough to cause your subconscious to default to this device when you really need something done. The flavor of the “better” is in a way that will make you choose this device because it makes those mundane computer tasks into mini works of eye pleasing art.